Galyn is Spanish for stripes and I am distinguished by a very distinctive set of black shoulder and wing stripes. I was found in an industrial area (perhaps looking for a job in this revitalized Silicon Valley economy?). Nobody wants to hire a very young budgie with no experience. Sigh. Do you think you might like to take me on as an intern? I`m not tamed yet, but I`m young and bright and eager to learn. 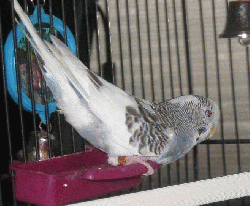 Young budgies are very trainable, you know. We could make a great team - just contact my coordinator and we can set up an interview!